Hey, I received my very first blog award! And it’s kind of an interesting one. 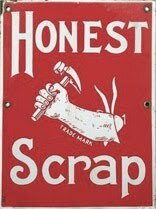 Recipients of the Honest Scrap award must list ten things about themselves that few or no people know. Hm…. I’ve passed the award on to seven more great bloggers. Please check their work out. 2.) I have an extremely good long-term memory and a very poor short-term memory. 3.) I’ve only danced at one event in my entire life…and I wasn’t any good. Hopefully I’ll learn to do it the right way. 4.) Nobody ever calls me Emily Ann, but I use it for my writing name because my mother always wished people did. 5.) I was homeschooled from the 8th grade on up and consider it to be one of the best things that ever happened to me. 7.) I was standing on top of the World Trade Center on September 11th, 2000. Yes, that one still freaks me out. 8.) I’m addicted to spanakopita (an oh-so-wonderful Greek snack), but I can’t pronounce the name. 9.) I refuse to read Agatha Christie’s The Mouse Trap because I still believe that someday I’ll be able to go to London and see the play in person. < Previous How much description? The Writer’s Perspective. Next > New book signing AND what’s up and coming. Wow! Thank you! I really consider it an honor!!! Congrats on receiving your 1st Award, and thanks for passing it along my way! It's always nice to be recognized like this. Great list going on here, too. It seems like I've been hearing of more and more people homeschooling. I definitely admire the dedication and success they have with it! I was homeschooled for a couple of years, too. Loved it!Congrats on the award! Congrats on the award and thank you for passing it along. It might take me a few days to think of 10 things that others don't know about me and which I'm willing to share, but I'll work on it! Emily – You have an award waiting on my blog.